This scripture is one of the most popular in the Chinese Buddhist canon, and it is considered the locus classicus on hell and its horrors. They are partially enumerated in chapter 5, but are far more elaborately drawn out in popular texts like Jade Guidebook (Yùlì Bǎochǎo 玉历宝钞), translated elsewhere on this web site (link). More importantly, it is the primary scripture detailing escape from hell through the extension of merit by the merciful Dìzàng. It tells us who he is, and how he comes to be so important. As far as I know, we lack the Sanskrit original of this work. The Chinese text was among those translated into Chinese in the late 600s by a monk from Khotan (Hétián 和田) in western Xīnjiāng 新疆 named Śikṣānanda in Sanskrit, Shíchā-nántuó 实叉难陀 in Chinese). 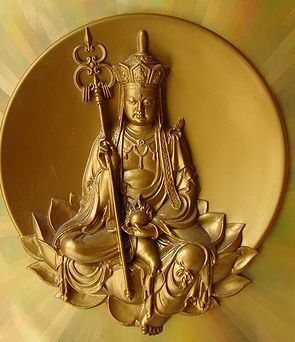 However it is also an occasion to appoint the bodhisattva Dìzàng wáng 地藏王 (Kṣitigarbha) to look after humanity after Sakyamuni’s death and before the arrival of the buddha of the future, Maitreya (Mílè 弥勒). The name Dìzàng (like Kṣitigarbha) means “earth treasury,” and refers to his accepting a position overseeing the dark realms of the dead in hope of liberating souls from suffering insofar as their karmic balances will allow. He is appropriate for the task because of the great merit he has acquired over many incarnations, but at the beginning of our extract this fact is still unknown to some of the other figures in the assembly. The embarrassing and seemingly slightly ungenerous question is put by the King of Self-Mastery. 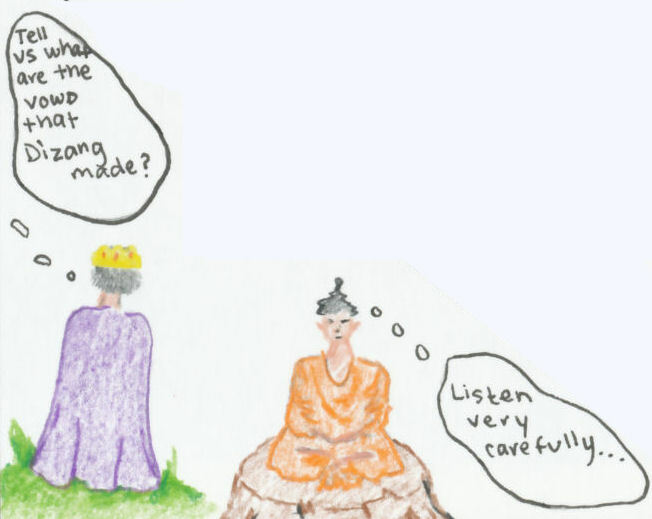 In answer to the king’s question, the Sakyamuni Buddha describes Dìzàng’s vows and merit. The two stories he relates in our extract involve past incarnations of Dìzàng, but are sometimes taken as independent (even competing) stories of his life on earth. Indeed, in the 1960s the second one of them became a full-length motion picture (called “The Saviour Monk” in English, “Dìzàng Wáng” 地藏王 in Chinese). To simplify presentation here, lines are numbered to facilitate class discussion, and the text is divided into arbitrary “pages” to which I have added titles. The engaging pictures illustrating the story are from three of the students in my UCSD class on Chinese popular religion in Winter, 2016. On page 1 we join the conversation in progress as the King of Self-Mastery asks his embarrassing question. Go to bilingual page: 1, 2, 3, 4, 5, 6, 7. Go to English-only page: 1, 2, 3, 4, 5, 6, 7. A full translation of the entire scripture, with a religious commentary, was published in book form as Anonymous 1974, which is available in a slight revision at the web site of the Sagely City of Ten Thousand Buddhas (main link, this text). Another full translation, although in my view an infelicitous one, is available at the web site of the Buddhism Study & Practice Group of SUNY Stony Brook (main link, this text). A wikipedia page introducing the scripture is characteristically informative (link). 1974 Sūtra of the past vows of the Earth Store Bodhisattva: the collected lectures of Tripiṭaka Master Hsüan Hua. Tr. 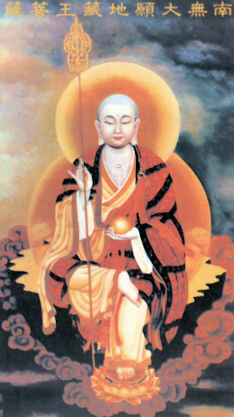 by Bhikṣu Heng Ching et al. New York: Institute for Advanced Studies of World Religions. 1995 Dìzàng púsà běnyuàn jīng. 地藏菩薩本願經。 Taipei: Pú'ēn Yìnshuā Qǐyè Yǒuxiàn Gōngsī. 菩恩印刷企業有限公司. 1975 Fójiào dà shèngjīng. 佛教大聖經。 (Sacred books of Buddhism.) Kaohsiung: Rénshēng Shūjú. 人生書局.